In Back to the Barrens, George Erickson, the best-selling author of True North: Exploring the Great Wilderness by Bush Plane, returns to the far north in search of new sights and stories to tell. Like Robert Service and Jack London, the giants who captivated us with tales told across a flickering campfire, he invites new readers to climb into the Tundra Cub II and fly off to a land where the northern lights shimmer, the rivers run cold, and cares slowly wither and die. 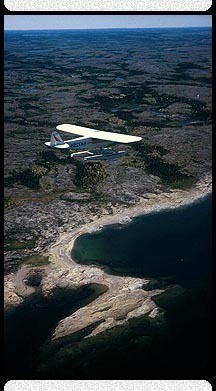 We'll camp on a fog-bound Hudson Bay island, alert for polar bears. Moving inland, we'll follow musk oxen, stroll through caribou herds that cover the earth like living carpets and laugh at arctic hares that run on their hind legs like men. Near the Arctic Circle, we'll enter a land where the sun, like a moody teenager, refuses to go to bed, then six months later declines to rise. As we wander from campsite to campsite like a bee from blossom to blossom, we'll dust off treasured memories that reach back forty years. Back to the Barrens, like the author's True North, provides a fascinating tour of the far North, of aeronautics, science, mythology and history in an entertaining, readable book written with humor by a man with the capacity to dream, and the ability to make his dream come true. 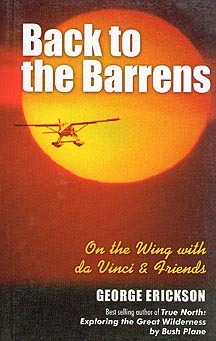 Back to the Barrens:On the Wing with da Vinci & Friends retails for $17.95, but for a signed, postage paid copy, mail $16.00 to George Erickson at 4678 Cedar Island drive, Eveleth, MN 55734.